Say you're single in Japan. In your daily life, you don't have many opportunities to meet potential partners. That's why gōkon 合コン（） were created. A gōkon isn't all that different from a group date. But arranging a gōkon takes a lot of time and energy, and you only meet two or three potential partners per session. An izakaya where you share your table with strangers for the purpose of meeting a romantic partner. 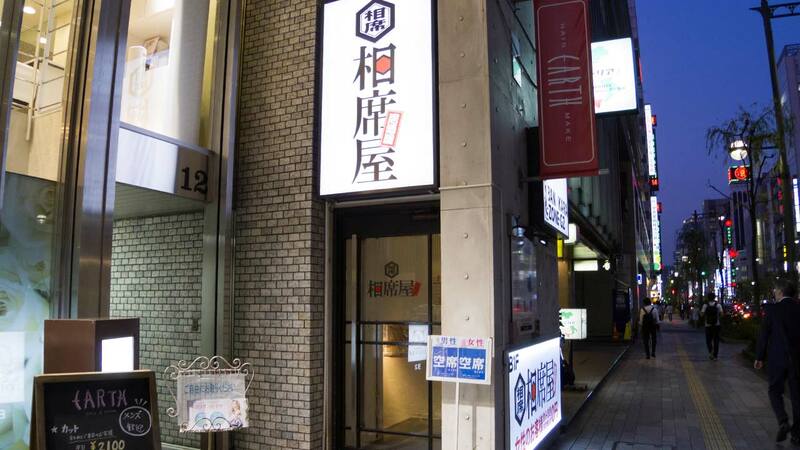 Enter a new addition to the gōkon movement: the aiseki izakaya 相席居酒屋（）. Aiseki 相席（） means "sharing a table" and izakaya 居酒屋（） is a kind of Japanese restaurant that serves drinks and small plates. Put them together and you get an izakaya where you share your table with others, giving you more opportunities to meet more people! But are aiseki izakaya only for people interested in romance? Maybe not. Aiseki izakaya could be a good way for foreign people living in Japan to practice and improve their Japanese. 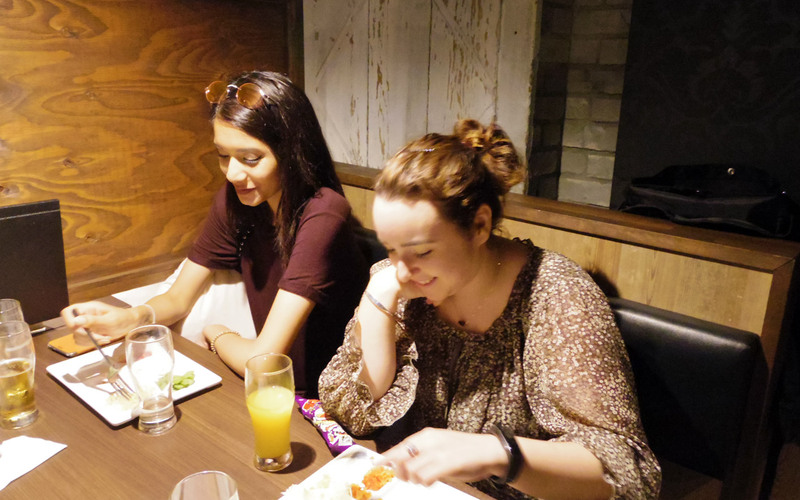 I gathered a group of willing foreigners and went to an aiseki izakaya, called Aisekiya, to test my theory. Is an Aiseki Izakaya a Good Place to Practice Japanese? Aisekiya is the largest aiseki izakaya chain in Japan. At the time of writing this article, they currently have seventy locations, and people wait for hours just to get in. 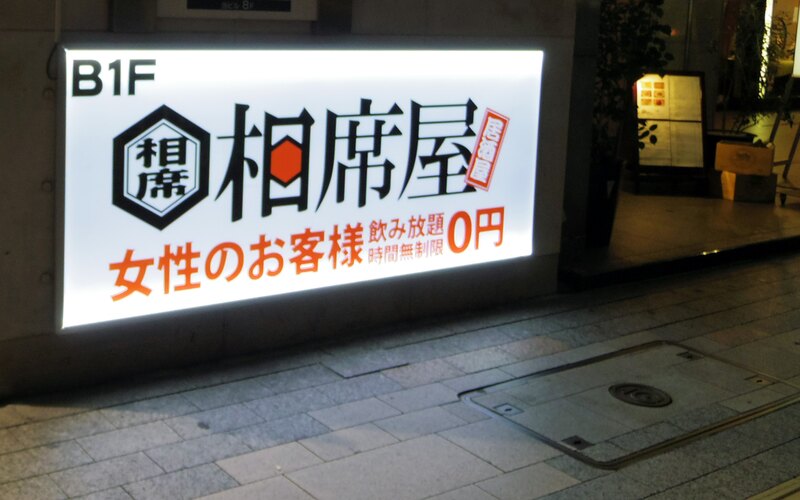 Their name adds a ya 屋（） to aiseki, making it a store or shop (屋/ya) for "sharing a table." Aisekiya's pricing structure is a time-based system. While you're there, you can eat and drink (alcohol included) as much as you want. The twist is male customers are charged ￥1,500 (approximately $15 USD) every thirty minutes, but female customers don't pay anything. Other aiseki-style restaurants may charge differently, but for the most part, women pay less or nothing at all. Our female team, Elodie and Sonia, met for the first time that night, but it didn't take long for them to become friends. They were both from France, vegetarians, and the same age. While at Aisekiya, you can eat and drink as much as you want. The twist is that male customers are charged ￥1,500 every thirty minutes, but female customers don't pay anything. Elodie came to Japan a few months earlier and was attending a language school in Tokyo. Sonia had been in Japan for the past year on a working holiday. Although she understands Japanese well enough, she wasn't confident with her speaking skills. I would say our female team was at a beginner level of Japanese. 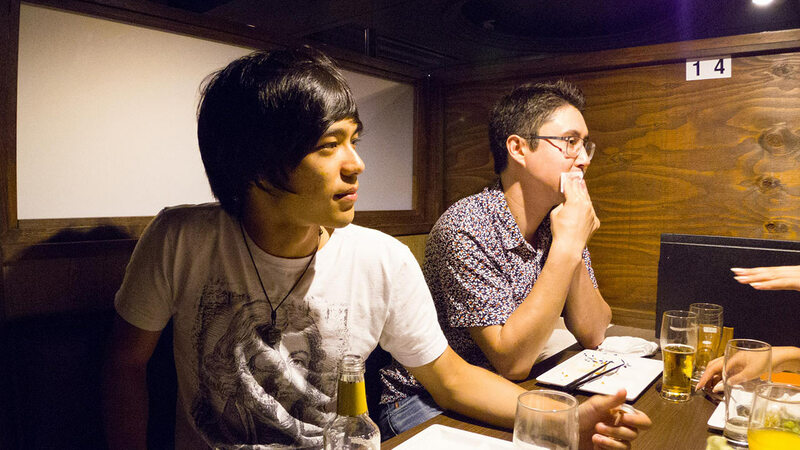 Our male team, Lucas and Koichi, also met for the first time that night. But because they are both open people, they became friends immediately. Lucas goes to university in Tokyo and had taken some Japanese courses before. Koichi… you can just read about him on the Tofugu people page. The male team's Japanese level was intermediate/advanced or above. With both of these teams, we were able to cover a wide spectrum of Japanese levels. But please keep in mind these are the individual experiences of only four people. Your results will vary! We went to the Aisekiya in Ginza, Tokyo. Ginza is a popular nightspot for salarymen and women, and the customers at Aisekiya's Ginza location reflected this. Although I haven't been to all the Aisekiya in Japan, I imagine the customer base is a lot of younger working people, no matter where you go. In front of the door was a sign that said kuuseki 空席（）, letting us know there were open seats for both males dansei 男性（） and females josei 女性（）. We had coordinated with the staff beforehand, and they suggested we arrive a little early to make sure there were open seats. I got there first, so I went downstairs to get things set up. The first thing you see is a big, important looking sign with ten Aisekiya commandments written on it. Don't dress too casually. Dress in a way that's appropriate for sharing a table with people. Everyone kanpai (do a toast) once you take your seat. Do a quick, fun self-introduction. Do not force others to drink alcohol. Warm up with shots and games. Do not say or ask anything rude. Exchange contacts when you get close/it's going well. 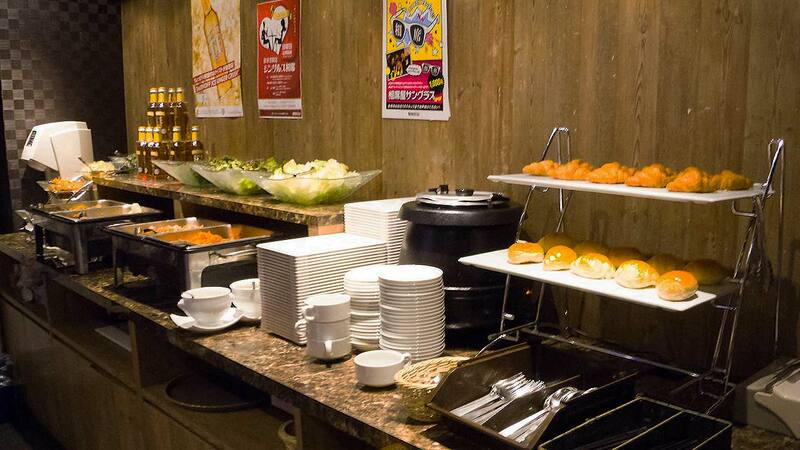 Be smart about setting up an after-party/meeting somewhere else (after Aisekiya). No sales or soliciting allowed. When you go to Aisekiya, make sure you follow these rules. You might be wondering about the dress code though. How casual is too casual? Everyday attire is OK! Work clothes and flip-flops are not allowed. If you use your best judgement and don't wear flips-flops, you should be fine. 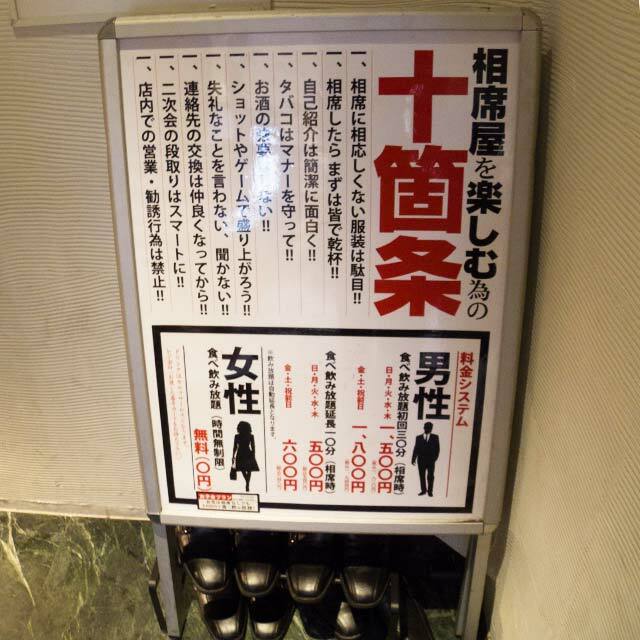 If you mess up, there are some shoes at the Ginza location you can borrow. The food and drinks (at this location, anyway) are self-serve. That includes alcohol! 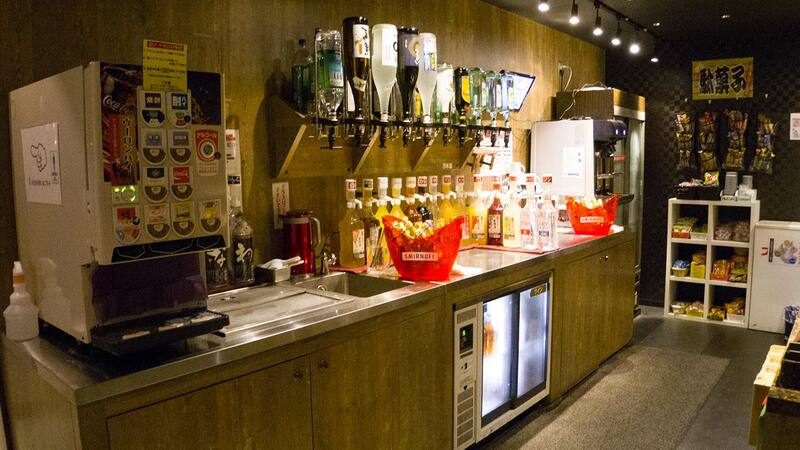 Drinks options are soft drinks, many bottles of alcohol (saké, shochu, and mixers), tea, water, and more. I don't think I've ever seen a self-serve alcohol bar before, so that was interesting. The actual drinks were better than expected considering it was all-you-can-drink, and there was a decent variety of alcohol. Foods were satisfying but mediocre. Not terrible, but nothing to write home about. Although there is no bartender to make drinks for you, you can make your own. Koichi mixed a few things that didn't taste good together and said he "made a terrible mistake." But it was a mistake he would fix. After that he went back to the automatic draft beer dispenser. All you need to do is put a pint glass in the slot and push a button. The machine takes care of the rest. The food bar has many options as well. Bread, soup, salad, edamame, chicken ketchup rice, yakisoba, karaage, fries, and some traditional Japanese deli items. Our female subjects, who are vegetarian, were able to eat many of the options provided. Also, there is a section for dagashi 駄菓子（）, snacks, and ice cream. All-you-can-eat, especially at these reasonable prices, is never going to be Michelin Star quality. But it was good enough for the price; even better if you're a lady, who gets it all for free. One thing to note before I tell you how it all went down: since we were visiting Aisekiya specifically to write this article, we had to get permission from other customers doing aiseki with us. To make things smoother, and to talk with more people, we set a few conditions before meeting anyone. Thirty minute time limit per session: Regular customers don't have a particular time limit, though you can change partners with a "change my seat card" (席替えカード), which you can find in the bathroom, then sneakily hand to a staff member. We set our limit to thirty minutes so our aiseki partners wouldn't have to stay in our experimental sessions for too long. Interpreter: Since Elodie and Sonia were not confident with their Japanese, Aisekiya decided I should do aiseki with them as an interpreter so potential partners wouldn't need to worry about the language barrier so much and feel more free to participate in the conversation. Pay for male customers: Since we weren't exactly aligned with the romantic intentions of aiseki, we paid for any male customers who partnered with Elodie and Sonia. After both our teams sat together for a bit, we split up so we could begin. At first Aisekiya wasn't busy, but pretty quickly our female group was matched up. Their first aiseki experience was with two salarymen wearing suits. Elodie and Sonia later described them as "a bit shy" because they were not overly talkative. I tried to warm up the table a bit, but avoided interpreting too much. I jumped in only when the women couldn't understand what the men said. I encouraged the girls to ask general questions about hobbies, jobs, and age. As they drank more, they started warming up, so I left them to hang out at the food counter for a bit. When I came back, both guys were trying harder to communicate, using body language and pictures on their phones. Elodie said there were some awkward silences, but to me they looked to be doing well and they got to practice speaking Japanese. 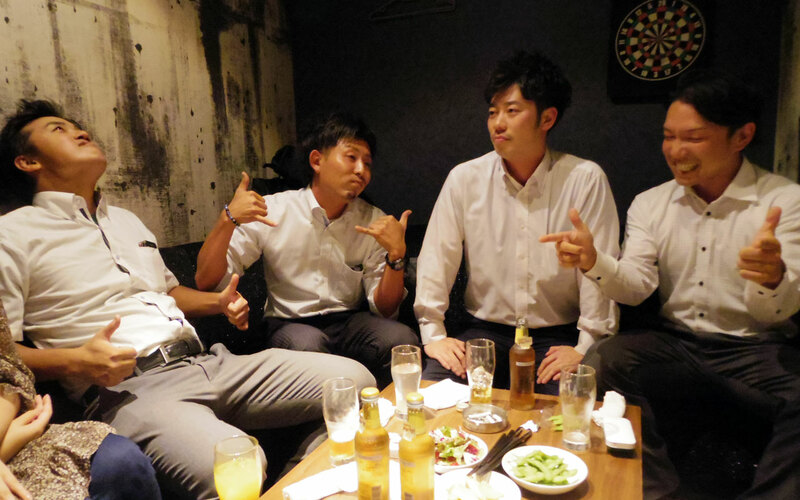 The second group was made up of four salarymen. The VIP room was the only one available at the time, so we decided to use it. It's a large private room and you can order drinks without going to the food area yourself. Compared to the first group, and perhaps even compared to most other customers, this group was super energetic and funny. They were very "high tension" (ハイテンション) and good at setting the mood and communicating, regardless of language barriers. Despite not speaking any English (or French) they answered questions well, using a mix of speaking, body language, and physical jokes. So everyone was constantly laughing. Both women thought this group was fun. Elodie later told me that "they were really open and it helped me so much to speak Japanese." For the guys, it took longer to get seated with someone, about thirty minutes. But Koichi said he and Lucas had a good time drinking and hanging out. This may be because there were fewer women than men, or fewer women wanted to be seated with people who were there just to write an article about the experience (though we never actually found out the real reason). The first pair that was seated with them had one talkative woman, and one shy one. They were both nice, and Koichi and Lucas were able to practice using Japanese. There were no problems here because both guys have higher levels of Japanese, though the first group really seemed to want to move on. When they all went to get more food, they used that opportunity to seek out new aiseki partners. [The first pair was] mildly disinterested, as a whole. The second group had a much better time. They were much more interested in the conversation, though this may be because one of the girls enjoyed travel and came off as more "international." After more general conversation, Koichi asked the women about aiseki, and how often they do it. One of them (who was more talkative than the other), said she "comes often because she gets to meet all kinds of interesting and different people." When Koichi asked what she thought when she found out there were some foreigners waiting for aiseki partners, she said she didn't think anything of it at all, just that it would be interesting and fun. She also said she thought foreigners tend to be more serious about relationships, so that might be a plus for certain people as well. The second group had a really good time, and they talked for much longer about a wider variety of things. It was good language practice, and Koichi said he liked it "because we got to talk about non-typical things, which is a little more challenging and presents more of an opportunity to have higher quality speaking and listening practice." We really don't have a great sample size. Every single aiseki "session" is going to be different because every person is different. Certainly, if you go to a lot of aiseki, you will have good experiences and bad experiences. Places like Aisekiya, with their ten commandments, help to sway things toward the positive, but your results will always vary. People aren't robots, after all. It's a great place to practice Japanese because the Japanese people who are there are trying to meet people. Elodie, who was the more outgoing of the two girls, seemed to have the most fun out of everybody. It was fun and really interesting. But I think it would have been more fun if I could speak better Japanese! It was difficult to listen to people and speak because there was a little … noise, except when we we were in the VIP room which was more comfortable. We also could call servers to go get drinks and had a magician who showed us impressive tricks. It's a great place to practice Japanese because the Japanese people who are there are trying to meet people. They are very comprehensive and try to understand us even if we don't speak Japanese well. Most Japanese people don't speak English, but it's better for us. We need to find words and have to speak Japanese only. If I can speak more Japanese, maybe. But honestly, I don't think so. Because all guys who we met were a little old—I don't think anyone was under twenty-eight—and they weren't really my type. But we only did two rounds so I can't really judge. Maybe I'll try one more time. Interesting. Talking to strangers was fun, but likely only because I got along with Koichi. In all honesty, the disinterest from most of the girls was palpable. Perhaps because of my lack of Japanese fluency, communication was slow for me. The Japanese practice was enjoyable, but I ended up repeating the same phrases and expressions that I'm most used to using already. Self-introductions are something I have trouble with though, and it was nice to practice that specific point. Specifically as a man, not really. Better practice can be had at regular bars for cheaper, if one is willing to pull up a conversation1. I think meetups are also better as far as Japanese practice is concerned. I felt people at the Aisekiya were quite disinterested in language exchange, and were mostly looking for people with a similar cultural background. At the end of the day, it is a place to meet a relationship partner. Would Lucas go back to give it another shot? Even if I didn't have a girlfriend, I likely wouldn't come back. I felt people in the Aisekiya environment were not thrilled to meet foreigners. If I was looking to meet new people, I'd try my luck at house parties or meeting a friend's friends. If I were a woman, I would consider going back if nothing else but for free food and drinks. I'm not sure how the experience is for women, nor how men treat foreign women in the Aisekiya environment, but free is free. I didn't speak very much because I am a little bit shy, but I really like the fact that I could listen to people speaking in Japanese. The biggest problem is getting out of those general, small-talk conversations. Especially if your Japanese is pretty good, you'll need to steer the conversation to things you're not able to talk about as easily. It's really hard to have an opinion because Lucas and I only talked to two pairs—or four people. Out of those four people, I only had a lot of fun talking to one person. Everyone else took a bit of work. Maybe they were shy. Maybe it was because we aren't fully Japanese. Maybe Lucas or I just have awful personalities. Maybe it was luck of the draw. Who knows! I'm sure if you do it enough, you'll have some great experiences, some bad experiences, and many so-so ones. But I really have no idea because time was short. I still had fun though—I like meeting new people. The biggest problem is getting out of those general, small-talk conversations. No matter what language you're speaking, this is going to be important for connecting with people, so I'm not saying it's a language learning thing, in particular. But especially if your Japanese is pretty good, you'll need to steer the conversation to things you're not able to talk about as easily. Otherwise you're just practicing what you already know, and not getting any better. Of course, you're paying ￥1,500 per thirty minutes, so if you're there for an hour it's like paying ￥3,000 ($30) for a language exchange. That's not too bad, considering you're getting as much food and drink as you want, but you will need to work hard to steer the conversation in directions that your partner(s) will find interesting so that the conversation gets fun. Would Koichi go back again? No, probably not. But I do think it could potentially be a good place to practice conversation, as long as you're outgoing. If I was a woman I'd consider going, because ￥0 for Japanese conversation practice, dinner, and drinks is a pretty sweet deal. What I learned from this experience, my observation, and our tester's comments is that your ability to practice Japanese at a place like this will depend on a few things. You are proficient enough in Japanese to introduce yourself, ask questions to help you get to know the other person, and understand what your partners are saying. You are at least open to the idea of finding a potential date (otherwise it's just a little mean, and you're wasting someone else's time). You are open to talk and meet with Japanese people who are most likely not particularly interested in cultural or language exchange. You are a woman and happen to be hungry and/or broke. If you fit a few of these criteria, I think it's worth trying. Whether we would go back or not, we all agreed it was an interesting life experience, and parts of it were a lot of fun. I can't guarantee if it will be the same for you, but I think a lot of you would have a good time. 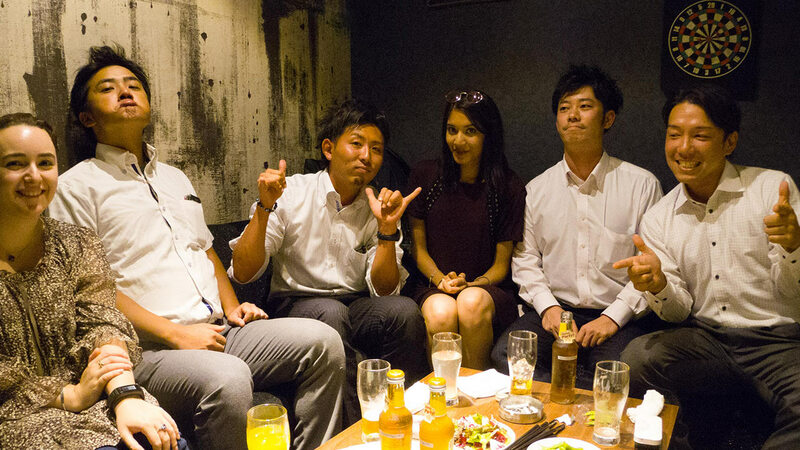 From a strictly language perspective, there are places where you can meet Japanese people to practice with (like the meetups Lucas mentioned), as well as online tools such as iTalki. Of course, there is something more "real" about meeting and talking to someone at an aiseki, even though literally the whole point is to create an artificial meeting. Consider the Neighborhood's Demographic: You can't choose your partners, but you can choose your neighborhood. Different areas of Tokyo tend to have different types of people. For example, the Ginza location has a mature atmosphere because most of their customers are business men/women. 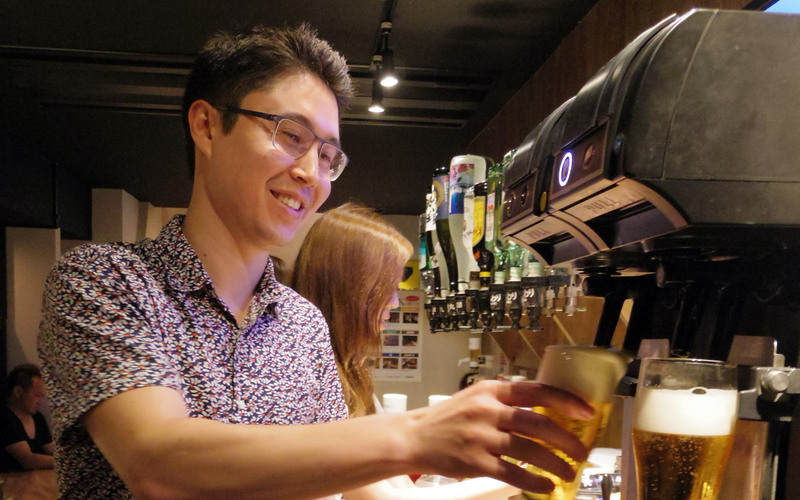 But the location near Takadanobaba, which is close to Waseda University, has a more "bustling" vibe thanks to the many customers who are students. Use Your Phone (When You Need To): If you have a hard time coming up with/understanding Japanese words, use your phone as a helper. Look up photos and show them to your partner. Just make sure to explain you're looking something up for the conversation when you do it. Otherwise they may think you're not engaged and/or being rude. Choose a Perfect Time: According to the Aisekiya staff, there are more female customers early in the evening, and more male customers later. If you don't want to wait to get matched up, use this "schedule" to choose your ideal time. As you can see, we had mixed results. I think aiseki is worth trying, but only because results will vary so much. But you can visit from time to time for extra speaking and listening practice. Just be friendly, outgoing, and careful out there! And if you are looking to date, you may just hit it off and have a wonderful conversation with someone new!